Digital encoders bring increased proportionality to the supplementary outriggers in conjunction with FASSI Stability Control FSC-S / FSC-SII. Replacing the existing linear micro switch with the digital encoder already used on the crane outriggers allows ‘mm’ precision measurement of the supplementary outrigger extension. 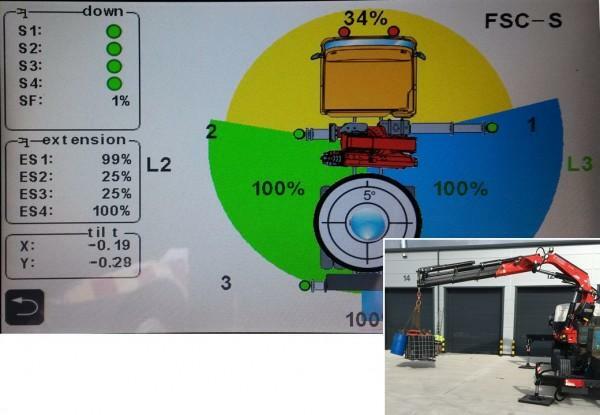 In conjunction with FSC-S / FSC-SII this allows the system to proportionally optimise lifting capacity at every possible crane and supplementary outrigger position. In the picture opposite the crane outriggers are at 25% extension and the supplementary outriggers at 25% & the crane has entered L2 with full lifting capacity controlled by the inclination sensor. At the same time as this development in the FSC system, FASSI have taken the opportunity to re-engineer the 5.8m and 6.9m supplementary outrigger beams with internal hoses and internal encoder wires. The elegant design packages critical components out of harms way and brings these beams into line with the rest of the hydraulic range.